View of the Amazon Music Download Store. Image © Mark Harris - Licensed to About.com, Inc.
Amazon.com, Inc. is a well-respected force in the online retail market, and so it was no surprise that it eventually entered the digital music download scene in 2007. Its digital music store, Amazon Music (previously named Amazon MP3), is now a well-established service that initially made waves in the digital music download market when it was first launched -- it was one of the first services at the time to offer DRM-free content. Songs come in the ultra-compatible MP3 format. Songs and albums can be cheaper than the iTunes Store (but not always). Personal Amazon cloud music locker that you can also upload songs to (250 songs maximum). Not available in as many countries as some other competing services (e.g. iTunes Store). Amazon Music's downloader software must be used for album downloads. Audio Format: MP3 (MPEG-1 Audio Layer 3). Supported Operating Systems: Windows, Mac OS X, iOS, and Android (including Amazon's Fire OS). Amazon Music operates as an a la carte system enabling you to simply select the tracks you want to buy and downloading them -- just like the iTunes Store. If you are already an Amazon customer then you don’t need to create a separate account for music. You just need your normal Amazon account to be able to purchase digital music. $0.99 for single tracks (some are lower than this). $3.99 to $6.99+ for the latest albums. The choice of music that Amazon Music offers is very good overall, but even with a catalog of over 30 million songs, it's still not quite as good as the iTunes Store. At the time of writing, there are 24 genres of music on offer that are logically listed down the left-hand side of the website. 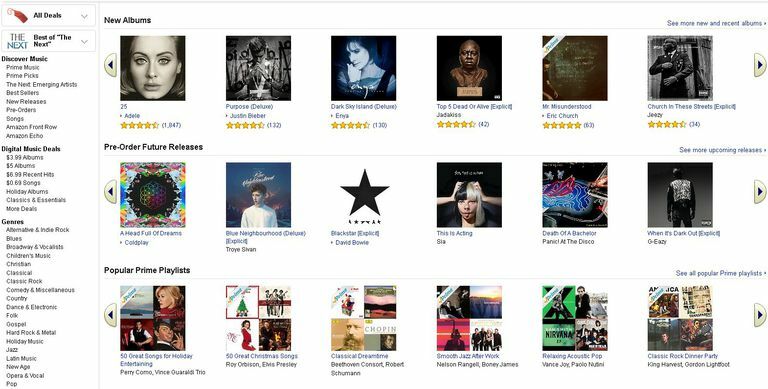 Amazon has also made it easy to use the search facility for finding a specific song, album, or artist if you know what you're looking for. The interface for purchasing music on Amazon Music is very similar to the other stores under Amazon.com. Although the design and layout can lead to confusion at times, the familiar orange 'buy' button with the price displayed is conveniently situated alongside each track or album. This makes a purchase very straightforward. Amazon also uses the '1-click' buy option for digital music that enables you to automatically use your stored credit card details to instantly buy in one step. When you buy music from Amazon Music it gets safely stored in your own personal music locker. This clod space is simply called Your Music Library (previously called Amazon Cloud Player) and can be accessed via the account drop-down menu at the top of the screen. Once a purchase has been made you'll be able to stream, download, or even create playlists. This is a small download manager that makes downloading multiple files easier to do. Once installed, the downloader software will run automatically every time you make a purchase from the Amazon Music store. The downside to Amazon’s software is if you want to purchase an album and download it at checkout, then you will have to install it. The only other alternative is to download the individual tracks that make up the album from your Amazon cloud music library. This may put you off from using the service if you don't want to install any software like iTunes. Amazon has stepped up to the plate and delivered an excellent service that is user-friendly, and more importantly, provides downloads that are highly compatible due to the unprotected MP3 format. Prices are very keen too, with single tracks available for as little as 69 cents and some albums available for under $4.99, this makes the Amazon Music store excellent value for money.